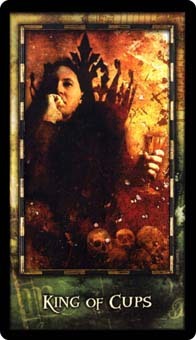 Today's Draw Classic*: King of Cups from the Archeon Tarot. What's your relationship with your inner demons? What are the strengths your demons have come to give you? What is your take on what our demons are about? The King of Cups usually indicates a sensitive, charismatic leader. But the Archeon Tarot adds a compelling twist to that with this entry from the book: Upon a throne of iron, the King of Cups takes counsel with his inner demons." You can see he's deep in thought, with the hollowed skulls of his past strewn about his feet. So how do we forge a healthy relationship with our demons? First, we all have them. These are the darker sides of our personality. Those which lead to depression, self-destruction, hedonism, greed, overblown ego and savagery, whether real or imagined, physical or verbal. At the root, the demon, imo, isn't as much these sinning actions, as it is the beliefs that lead to these actions...the inner beliefs/attitudes/opinions that tell you you are separate from the divine. Once you believe this, you perpetrate these actions and convince yourself you're even more separate. And that feeds on itself, creating more destruction, more shame, more separateness. Over our lifetimes, we find different ways to cope. Some deny their demons exist...that if they ignore them, they'll go away. Some revel in their demons to the detriment of the divine. Some use their demons as a fortress to protect their heart. And some drown their demons in drugs and alcohol. But our demon attitudes and behaviors can serve positive purposes in life. My nefarious mind has helped me out-think/anticipate those who would harm me in the past. Anger has helped to define boundaries. Other less-than-attractive skills have helped me survive difficult situations, even if only in the short term, before I had time to really integrate. And if any of us were in a true survival situation, the savage within us would rise to save our arses. Two related things I learned when I quit smoking apply here. One is that our demons aren't to be ignored or hated. They're to be acknowledged with non-judgment. One of the secrets to overcoming the pull of an addiction is not to steel yourself against the craving, but to let it flow through you...in one ear and out the other...with non-judgment. If you hold on to it or resist it in any way, it becomes stronger and embeds itself in you. So demons just "are". We can deny them and resist them all we want...if we want to give them power. We can torture ourselves with them, but they're not a mistake. Whether parts of the human condition that we've evolved beyond the need for, character flaws or parts that are just emerging within us, they're part of who we are and why we're here. Which leads to the second thing...the Cherokee story of the two battling wolves inside. One wolf is evil and one wolf is good. Which will win? The one you feed. If you feed the demons they get stronger and beget more pain, more addiction, more self-hate. If you feed the good wolf, that is what will grow inside you. The evil wolf will always be there, though. Some parts you may succeed in taming. Some parts will come in handy when needed. And other parts will become too weak to make a difference. So the answer to the initial question of how do you have a healthy relationship with your demons? You don't deny them or fear them or ignore them or feed them. You see that they are there, understand their strengths, forgive their weaknesses, and turn toward the other wolf, knowing that, when needed, you have two wolves to fight a battle. But that the good wolf will always keep the troublemaker in check. Another part of the answer comes from the first thing I wrote up there...that the true demon is believing you are separate from the divine. Even when you're entertaining a demon, you're at one with the divine. You can never NOT be. And demons aren't outside of you, they're within you, part of you, part of your journey on earth. They're as much a part of what God has given you as artistic talent, a beautiful voice or flaxen hair, for example. They are the fodder of profound lessons. Clearly, some people will take issue with this. If you have a different idea about the demons within, feel free to comment and let others hear another side of the story. But this is what I believe. We all have things and thoughts and feelings that we're ashamed of. We've all walked down a "wrong" path. And we've all emerged with valuable lessons and information. If you choose to cast that aside and deny it, which wolf do you think you're feeding?